Heating Up: MREs – Next Hipster Trend is what's HAWT, NEXT! Remember back when you first decided to go vegan? It seemed like a great idea at the time, but you didn’t realize how much work it would turn out to be. Shopping daily for fresh vegetables, researching and exchanging recipes, endlessly peeling and chopping. All of it had you domesticated halfway to the suburbs. And in the end, what did you get out of it? Hunger pangs and a mildly satisfying nutloaf. That experiment had nothing on your brief flirtation with freeganism, though. Don’t get us wrong, we know that the whole concept sounded fantastic. “Screw commerce, I live off the land,” you said, gesturing with a lit gutterbutt toward the garbage containers behind some questionable Thai restaurant. “The hunter-gatherers didn’t need a frickin’ debit card in order to satisfy the most basic necessity of life. Their career was finding food where it naturally grew. Well, I’m the urban version of that, the authentic extension of a longstanding tradition.” That was about a week before the roundworms took hold in your lower GI tract. The more cynical of us noticed you didn’t Dumpster dive for vermifuge, but nobody blamed you for a second. You’ll notice that thus far, your dietary adventures have fallen prey to two problems: effort and spoilage. Well, we’re here to tell you how to conquer those enemies with one amazing piece of gastronomical technology. Friend, you’ve got to <a href=”http://www.amazon.com/gp/product/B005Q2SVDU/ref=as_li_ss_tl?ie=UTF8&camp=1789&creative=390957&creativeASIN=B005Q2SVDU&linkCode=as2&tag=nexhiptre-20″>get yourself some MREs</a><img src=”http://ir-na.amazon-adsystem.com/e/ir?t=nexhiptre-20&l=as2&o=1&a=B005Q2SVDU” width=”1″ height=”1″ border=”0″ alt=”” style=”border:none !important; margin:0px !important;” />. 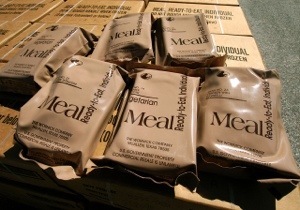 Meals, Ready to Eat are a staple for American soldiers fighting in foreign territories, and they’re quickly becoming a staple for American hipsters living in gentrified ghettos. Let’s face it, cooking is for Rachael Ray. Complicated dietary restrictions are for overprotective moms. Let the yuppies slave over $1,500 copper pots, trying to turn spaghetti squash into spaghetti. Meanwhile, you’ll just roll home from band practice, dump some water in a plastic pouch, insert the chemical heating pack along with the tri-laminate retort pouch containing your food, and wait a few minutes. Boom, you’re eating Country Captain Chicken and Buttered Noodles. You can jam these things in your backpack, your retro neon green fanny pack, or hell, even under your seatbelt that you’ve fashioned into an actual belt if you’re in a pinch. They’re pretty much indestructible. Like your hipness.